Every spine has certain natural curves. These curves round our shoulders and give our lower back a slight arch. However, some people’s spines also curve from side to side. This is not a function of poor posture, and these curves can’t be fixed by merely standing up straight. The condition of side-to-side spinal curvature is called scoliosis. On an x-ray, these spines with scoliosis look more like an “S” or a “C” than a straight line. The spinal column with scoliosis may also have rotated slightly, making the person’s waist or shoulders appear uneven. In more than 80% of scoliosis cases, a specific cause is not found and such cases are termed idiopathic meaning “of undetermined cause.” This is especially true among the type of scoliosis seen in adolescents where three to five percent will be found to have some form of scoliosis. Approximately 70% of AIS patients are girls, and their curves tend to be more progressive. A genetic pre-disposition exists for some adolescents to develop AIS and this is currently being studied. It is important that patients seek treatment for AIS because progressive scoliosis, if left untreated, may result in significant deformity. This deformity can cause significant psychological distress as well as physical disability, especially among adolescent patients. The deformity from scoliosis can have dangerous physical consequences. 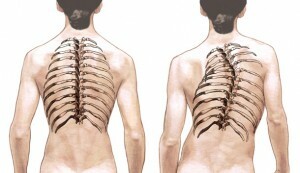 As the spine rotates, the rib cage is affected, and this can lead to serious heart and lung problems. 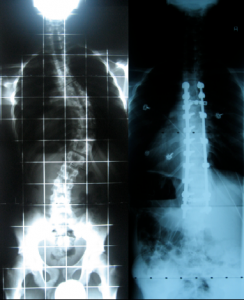 If progressive scoliosis affects the lumbar spine, the resulting pain can be very debilitating. Dr. Stieber’s assessment includes a medical history, physical and neurological exam, and diagnostic testing with x-rays and other methods. Medical history may include questions about the parent’s genealogy and whether there other family members with scoliosis. Dr. Stieber will check for underlying medical conditions that might otherwise be causing the scoliosis. Additionally, the patient’s age, onset of puberty, and growth history will help us to determine the number of years that remain before the child reaches skeletal maturity. At skeletal maturity, curve progression may stop as long as the curve is less than 40-45 degrees. The curve may continue to progress throughout adulthood, if the curve exceeds 40-45 degrees. Some cases of AIS can be treated non-surgically and others require surgical intervention. Small curves (those less than 15-20 degrees) are observed for possible progression over a period of time. At this stage, no specific treatment is needed. In adolescents, larger curves (those between 20-40 degrees) may require bracing to prevent further progression of the curve. Some patients find wearing the brace 16 to 23 hours every day difficult. Braces can be uncomfortable, unattractive, hot, and can make a child self-conscious even though well disguised under clothing. However, when bracing works and surgery is avoided, the commitment required is worthwhile. Unfortunately, not all curves respond to bracing. Cervicothoracic curves (from the middle of the back up into the neck) and curves greater than 40 degrees tend to respond poorly to bracing. Older patients who are closer to skeletal maturity may also have a limited response to bracing. Surgery may be recommended for curves over 40 degrees. Surgery can be performed for smaller curves if the appearance of the curvature is bothersome to the patient or if other symptoms are associated with the scoliosis. The goals of surgical treatment are to correct the curve and to prevent curve progression. This is usually performed by placing metal implants into the spine that are attached to rods which correct the spinal curvature and hold it in the corrected position until fusion, when the spinal elements mend together. Dr. Stieber uses various surgical procedures to treat AIS. The overall goals of the procedure are the same, but the techniques and instrumentation used will vary from case to case. Dr. Stieber may perform the procedure from the front (anterior) or from the back (posterior). The most common approach to adolescent idiopathic scoliosis is the posterior (back) approach. In the past, using hooks for fixation, patient activities were restricted for at least 6 months after surgery. With recent advances, pedicle screws have been applied to the spine allowing for better correction. Pedicle screws provides extremely solid fixation, allowing patients to return to activities within 2-3 months after surgery. A curvature of 50° is often brought down to under 10° with these techniques. 16 year old male diagnosed with adolescent idiopathic scoliosis. Treated with a posterior approach utilizing pedicle screws and rods.